It is with great pleasure that we invite you to visit our web site. By surfing through the different sections you will discover our product line and Company mission. This site is in constant evolution as proof of our commitment to providing you with the very latest information. IDROBENNE has been manufacturing quality hydraulic grapples for truck cranes and excavators since 1994. Our production is focused on quality-finished equipment for the end-user. Our own experienced staff carries out all design, engineering, production and final testing. The Company is totally independent from any crane and excavator manufacturer; therefore all technical and reserved information remains confidential. These factors have helped IDROBENNE gain recognition as a leading “Grab expert” throughout the truck crane and excavator attachment industry. The Company is located in Northern Italy, near Brescia, where some of the most important European steel companies were born. Verona-Montichiari Airport, and the main "A4" Milan - Venice highway are just a few kilometres away. Our modern facility is 7.000 square meters, over half of which is covered. To ensure highest quality standards, IDROBENNE manufactures every component internally, where trained personnel monitor each process. State-of-the-art computer engineering software combines with the most advanced processing machinery for precision parts, in a clean and friendly working environment. IDROBENNE believes suppliers are key partners to our production of quality products at a reasonable price. All main suppliers have been through a long selection process, but now work as a team with the Company and share the same mission. Some raw materials and components are imported from Germany and Sweden. IDROBENNE: made in Europe! IDROBENNE supplies some of the most important Italian and European truck crane and hydraulic excavator manufacturers. It deals directly with more than thirty-five Countries all over the World. Company mission is to supply good quality products to professional and demanding clients. IDROBENNE cares about the reliability of its products even in the worst working conditions. 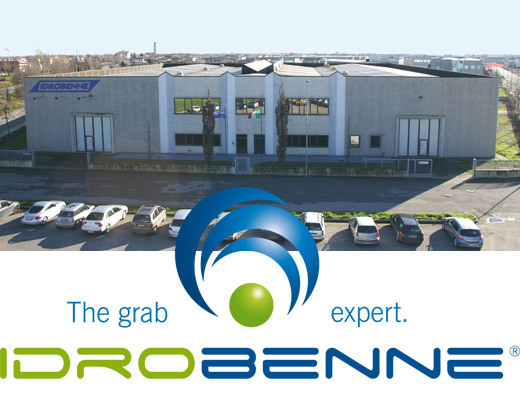 IDROBENNE's staff is focused on customer requirements. We believe that, regardless of the type of machine being used, the grab plays a very important role. We welcome the opportunity of helping you find the best tool for your job! Please do not hesitate to contact us for any further information, or to discuss your own particular application in more detail.